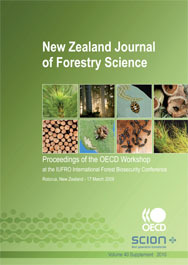 This supplement to volume 40 of the New Zealand Journal of Forestry Science contains the proceedings of the OECD Co-operative Research Programme sponsored workshop held on 17 March 2009 during the IUFRO International Forest Biosecurity Conference, 16-20 March 2009, Rotorua, New Zealand. Published Online - 4 Mar 2010. [507.2 KB] (pdf). Summary of Facilitated Discussion: Managing the biosecurity threat to forests in a changing global environment: links between science, policy, regulation and management. Richardson, B., Ramsfield, T. D., & Horner, M.
How can scientists be more effective in their contributions to policy and operational management? How can international collaboration help to meet these science challenges? Richardson et al. (pp. S137-S143) summarise the main points that arose in response to these questions. Published Online - 4 Mar 2010. [584.9 KB] (pdf). Eradication of invasive forest insects: concepts, methods, costs and benefits. Brockerhoff, E. G., Liebhold, A. M., Richardson, B., & Suckling, D. M.
In this review, Brockerhoff et al. (pp. S117-S135) outline the sequence of steps required in well-managed operations; examines characteristics of successful and unsuccessful eradication campaigns; describes methods and tools known to be effective against specific pests; and discusses the analysis of costs and benefits of eradication programmes. Published Online - 4 Mar 2010. [954.7 KB] (pdf). Invasive exotic insects can cause substantial damage to trees and the environment, and may reduce biodiversity. They can have a large negative economic effect on the forest industry, urban amenity trees and numerous other sectors, and they may necessitate extensive management expenditures. For such high-impact invaders, eradication is desirable but also difficult and often highly controversial. It requires substantial input of resources and commitment from managers and stakeholders, including the general public. Appropriate tools for surveillance and control of the target species must be available if success is to be achieved. This review outlines the sequence of steps required in well-managed operations; examines characteristics of successful and unsuccessful eradication campaigns; describes methods and tools known to be effective against specific pests; and discusses the analysis of costs and benefits of eradication programmes. Feasibility of eradication is increased by early detection, which is facilitated by systematic surveillance. 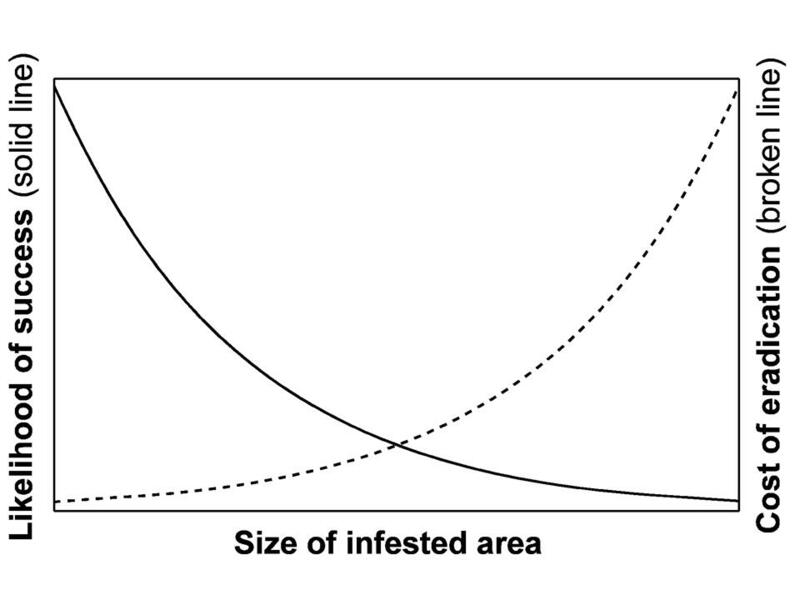 A strong positive relationship exists between size of the affected geographical area and the cost of eradication. Treatment costs for large populations may be prohibitive. Five recent campaigns against lepidopteran species in New Zealand have provided substantial economic benefits, despite the fact that various non-market values were not considered. Although progress has been made in the development, utilisation and integration of eradication tools, some insects are still not amenable to treatment. There is a need for new methods shown to have a minimal effect on other organisms, including human beings. Public attitudes to eradication programmes must always be taken into account during planning and deployment. Confronting challenges to economic analysis of biological invasions in forests. Holmes (pp.S105-S116) proposes that microeconomic models of damage due to specific invading organisms be aggregated across the forest landscape by considering the rate at which acute, short-run economic impacts accumulate over time and space. Published Online - 3 Mar 2010. [1.0 MB] (pdf). Wingfield, M. J., Slippers, B., & Wingfield, B. D.
Wingfield et al. (pp. S95-S103) argue that research regarding novel associations and host shifts between pathogens, insects and tree species should be vigorously supported in order to reduce an emerging new threat to global forests and forestry. Published Online - 1 Mar 2010. [4.5 MB] (pdf). It is well recognised that pests and pathogens are increasingly threatening both natural woody ecosystems and plantation forestry world-wide. This threat is largely connected to the increasing movement of people and products globally, with concomitant introductions of pests and pathogens into new environments. Typically, these invasive alien organisms are accidentally transferred from areas where they are native to the same or closely related tree hosts, to elsewhere in the world. For tree pathogens, there are many well known examples such as those for the causal agents of Dutch elm disease, chestnut blight, white pine blister rust and pine wilt caused by the pine wood nematode. Equally well known examples for insect pests are the gypsy moth, the Asian longhorn beetle, various conifer infesting bark beetles and the emerald ash borer. In addition to these pests and diseases, the introduction of which should be easier to predict given knowledge of patterns of introduction, there is growing evidence that novel host, pest and pathogen interactions are evolving. In this situation, host shifts are apparently occurring where pests and pathogens are able to infest or infect trees that would previously have been considered as non-hosts. There are also intriguing, yet very worrying, new associations emerging between insects and pathogens that are able to cause substantially greater damage to the host trees than has been known for these organisms in the past. In general, these novel associations are poorly understood and due to their unpredictable nature, they seriously complicate quarantine efforts. There is clearly an urgent need to gain knowledge regarding patterns and processes underlying the emergence of host shifts as well as novel pest and pathogen interactions. Research regarding novel associations and host shifts, which might in the past have been considered esoteric, should clearly gain vigorous support in order to reduce an emerging new threat to global forests and forestry. Alien forest insects in a warmer world and a globalised economy: impacts of changes in trade, tourism and climate on forest biosecurity. Roques (pp. S77-S94) examines the effects of changing world trends on the introduction, establishment and spread of exotic insects associated with woody plants. Three aspects are considered: (i) commercial trade; (ii) tourism and consumer behaviour; and (iii) climate change. Published Online - 25 Feb 2010. [1.6 MB] (pdf). This paper examines the effects of changing world trends on the introduction, establishment and spread of exotic insects associated with woody plants. Three aspects are considered: (i) commercial trade; (ii) tourism and consumer behaviour; and (iii) climate change. The current literature indicates that there are two key pest pathways: movement of wood ( (including solid-wood packaging), and the ornamental plant trade. The number of pests introduced along these routes is positively correlated with the volume and source of imports. It is likely, therefore, that improvements in regulation of the movement of wood will lead to a decrease in pest entry via this pathway. However, complexities associated with the ornamental plant trade will ensure that it remains a high risk route. There is evidence to suggest that numbers of interceptions at airports are positively related to the volume of air traffic from the countries from which passengers originate. Shifts in climatic conditions are likely to affect the survival, fecundity, development and dispersal of native insect species. However, it is difficult to entirely disentangle the effect of climate change from that of other physical or chemical factors, and/or other biotic causes. Pest risk assessment and invasion pathways: Invasive weeds. Lonsdale (pp. S73-S76) presents concepts from the epidemiological literature, that are relevant to weed risk assessment systems. Published Online - 25 Feb 2010. [679.1 KB] (pdf). For pathogens and insect pests, risk assessments are carried out to determine to what extent they are likely to enter accidentally, as passengers on an imported commodity. By contrast, risk assessments of potential weeds are typically conducted on plants that people actually want to introduce, either as ornamentals, or for agriculture. Here, the focus is on determining whether a species, unknown elsewhere as a weed, could become invasive in the country of proposed introduction. A proper assessment of risk here, therefore, requires us to understand what triggers a species to become invasive. Such understanding still eludes us, and indeed is at the frontier of ecology, yet weed risk assessment systems are already being implemented or adopted all over the world. I present concepts from the epidemiological literature, that are relevant to the assessment of such systems. Pest risk analysis and invasion pathways - insects and wood packing revisited: What have we learned? Humble (pp. S57-S72) reviews the lines of evidence that were used to support the development of the first pathway-based international standard for phytosanitary measures (ISPM), that for wood packing (ISPM 15). This standard requires mandatory treatment of wood used as dunnage, packaging, crating or pallets in international trade in order to mitigate populations of bark- and wood-borers potentially present in the raw wood. Published Online - 25 Feb 2010. [1.7 MB] (pdf). Webber (pp. S45-S56) argues that better education about the various risks of plant pathogens, plus new approaches to biosecurity, are needed to avoid further destruction of forests and natural ecosystems as a result of introduced pathogens. Published Online - 25 Feb 2010. [1.3 MB] (pdf). Examples of the accidental introduction of pathogens are commonplace. When released from hosts and habitats where they have co-evolved over millennia, some pathogens have proved to be highly invasive and extremely damaging to many plant species, including long-lived woody perennials such as trees. Opportunities for such introductions have grown hugely in recent decades with the vast increase in global trade, particularly the trade in living plants and timber products, as well as through the international movement of people. Although most introduced organisms are unlikely to establish when transferred to new regions, the potential for damage is large if they do and the impact on habitats and ecosystems is long term and usually irreversible. Our challenge is to understand and predict the likelihood of invasive behaviour, and to manage the pathways along which these organisms move to prevent their arrival at new destinations. Management of the risk posed by exotic pathogens is embedded in plant health regulations, which have their basis in the International Plant Protection Convention and the World Trade Organisation Sanitary and Phytosanitary Standards. The tool for assessing risk - the Pest Risk Analysis - is initiated if a pathway is identified as a potential pest hazard, or if phytosanitary policy is revised, but most often when an organism is recognised as a potential threat. Unfortunately this is usually only when a severe disease problem becomes apparent elsewhere, because of a newly escaped or emerging pathogen. Therefore, Pest Risk Analyses tend to be reactive, applied to named taxa, and assume that species are relatively homogeneous and genetically stable. 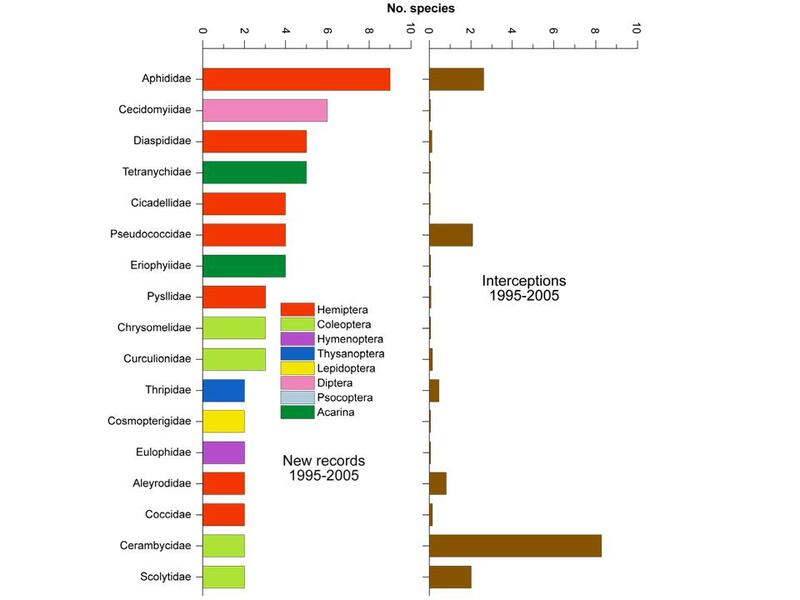 With short generation times, this may be a critical over simplification for pathogens especially as introducing these organisms to new environments and hosts exposes them to episodic selection which drives genetic change and adaptation. Once an organism is identified as a significant threat, biosecurity measures rely on treatments to destroy it such as kiln drying or pasteurisation, as well as inspection to detect it. Drawbacks in this 'pest-by-pest' regulation, with its reliance on inspection to intercept potentially damaging pathogens, are probably greatest with the global trade in live plants. To combat this, the International Union of Forestry Research Organisations Working Party on Alien Invasive Species and International Trade recently suggested focussing regulation and management on pathways rather than on specific individual pests. This entails placing emphasis on detecting pests at the origin of pathways, coupled with better understanding of what potential pests and pathogens might already occur there. However, although the global trade in plants and wood undoubtedly presents high risk pathways, other potential routes are often ignored or considered too difficult or sensitive to regulate. Better education about all these risks, plus new approaches to biosecurity, are needed if we are to avoid more destruction of our forests and natural ecosystems as a result of introduced pathogens. Pest Risk Analysis and Invasion Pathways for Plant Pathogens. Pest risk analysis - organisms or pathways? Evans (pp. S35-S44) suggests that a philosophy of "manage once remove many" needs to be developed as a component of pest risk analysis aimed at maximum pest risk reduction. In this context, live plants for planting pose the greatest threats and the greatest challenge in development of effective phytosanitary measures. Published Online - 22 Feb 2010. [1.8 MB] (pdf). Pest risk analysis is central to determining both country risks from potential biotic threats and identifying the nature and scale of measures the country puts in place to address the identified threat. International Plant Protection Convention procedures, described in International Standards for Phytosanitary Measures No. 11, are the basis for pest risk analysis and recognise three elements; initiation, pest risk assessment and pest risk management. Among the components of the initiation phase, the decision on whether to base the pest risk analysis on a pest or a pathway for movement of a pest is fundamental. However, it must be recognised that the two are inextricably linked, although the tendency to concentrate on the pest is dominant. A pest-based approach has the advantage of focus on a named organism but, increasingly, there is recognition that other pest organisms that might be associated with the same pathway will tend to be missed. Such a 'list-based' approach has been valuable in raising awareness and in tackling recognised threats, but it is probably true to state that most pest-based pest risk analyses have been retrospective and only initiated when a pest has actually been found in a new geographic area. It is, therefore, important to recognise that a range of organisms in addition to those on a phytosanitary list can move along a given pathway. This suggests the need for a more generic approach to risk mitigation of high-risk pathways so that organisms not on current phytosanitary lists are accounted for. In this context, live plants for planting pose the greatest threats and the greatest challenge in development of effective phytosanitary measures. In attempting to manage multiple threats on a given pathway, a philosophy of "manage once remove many" needs to be developed as a component of pest risk analysis aimed at maximum pest risk reduction. Exploiting the Achilles Heels of Pest Invasions: Allee Effects, Stratified Dispersal and Management of Forest Insect Establishment and Spread. Liebhold, A. M., & Tobin, P. C.
Liebhold and Tobin (pp. S25-S33) argue that two traits common to many invading species can be exploited in the design of eradication and containment strategies. The first trait is the Allee effect, in which per capita growth rates decline with decreasing abundance. The second trait is stratified dispersal, in which occasional long-distance dispersal results in the formation of isolated colonies ahead of the continuously infested range boundary. Published Online - 19 Feb 2010. [797.7 KB] (pdf). Given the increasing problem of invasions by forest insects, there is an urgent need to develop effective strategies for managing them. Trends of escalating globalisation impede ongoing efforts to limit the arrival of new species. Consequently, either preventing establishment (through eradication) or limiting the spread of alien species are likely to play increasingly important roles. Here we argue that two traits common to many invading species can be exploited in the design of eradication and containment strategies. The first trait is the Allee effect, in which per capita growth rates decline with decreasing abundance. Allee effects can arise from several different mechanisms and are capable of driving low-density populations to extinction. 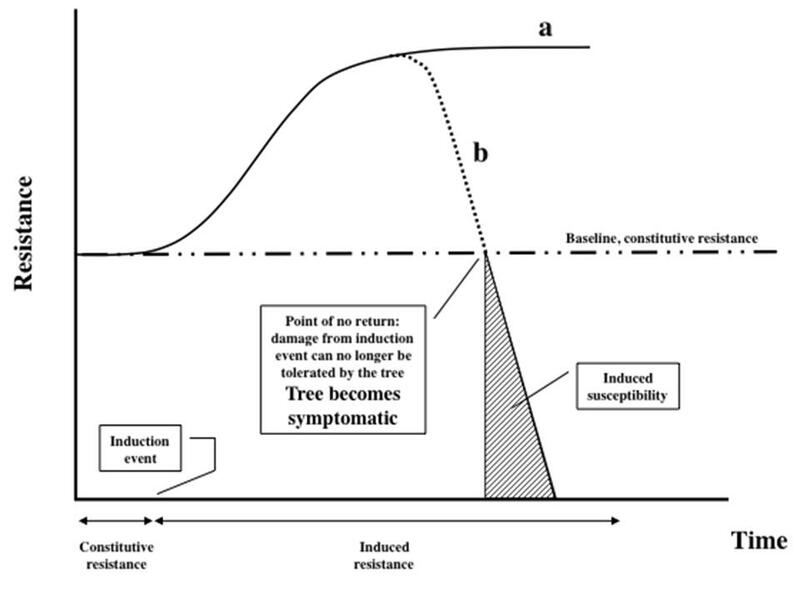 Strategies to eradicate newly established populations should focus on either enhancing Allee effects or suppressing populations below Allee thresholds such that extinction proceeds without further intervention. The second trait is stratified dispersal, in which occasional long-distance dispersal results in the formation of isolated colonies ahead of the continuously infested range boundary. These colonies grow, coalesce and greatly increase spread rates. An efficient approach to containing the spread of invading species focuses on locating and eradicating these isolated colonies. Thus, Allee effects and stratified dispersal both represent 'weak links' in the invasion process that can be exploited in invasion management strategies. Published Online - 12 Jan 2010. [624.2 KB] (pdf). Under natural conditions, forest ecosystems are usually stable, despite the constant presence of arthropods and pathogens inherently capable of killing their tree hosts. It is likely that the phenotypic plasticity of trees, which includes inducible resistance mechanisms against attacking organisms, plays a crucial role in these interactions. Systemic induced resistance may be a common and important phenomenon in forest trees, one that allows for balanced partitioning of available resources between growth and defence. However, such physiological tradeoffs are affected by environmental variables, such as resource availability (e.g. nutrients, water, light) as well as by silvicultural activities. There is also evidence that systemic induced resistance or its counterpart, systemic induced susceptibility, may be operative concurrently in the same tree, depending on the specific organs under attack. Lastly, all these host responses can be strongly modulated by systemic cross-effects between pathogens and/or insects. While it is established that trees possess systemically inducible defences, it is still uncertain how this knowledge might be applied to control forest pathogens and insects. 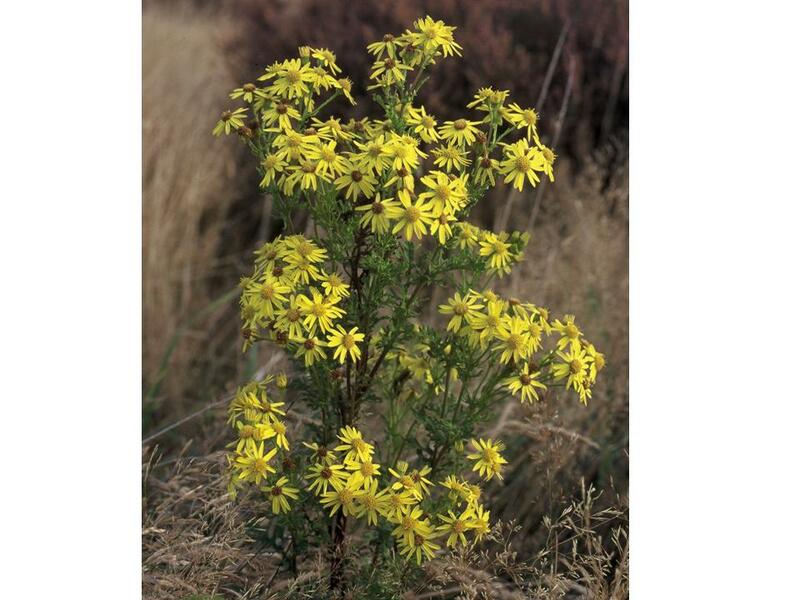 This is complicated by the classic approaches used for the silvicultural control of pests, which are fundamentally centred on the assumption that plants characterised by higher vigour are also less stressed and thus more resistant to attack. In many cases, this is a fallacious premise. Hammond (pp. S11-S14) discusses the relationship between biosecurity managers and scientists. He concludes that biosecurity managers need to fund core science capability for the long term so it will always be available when needed, while scientists need to be flexible and responsive to biosecurity priorities. Published Online - 24 Dec 2009. [625.0 KB] (pdf). Peter Thomson Director Post-Border, MAF Biosecurity New Zealand (pp. S5-S9) discusses how achieving greater integration of science and policy is essential to achieving better results in biosecurity. Progress is being made to ensure that policy decisions are informed by science and deliver positive results in the management of biosecurity risks. Published Online - 22 Dec 2009. [635.9 KB] (pdf). Richardson, B., & Hood, I. A.
Richardson and Hood (pp. 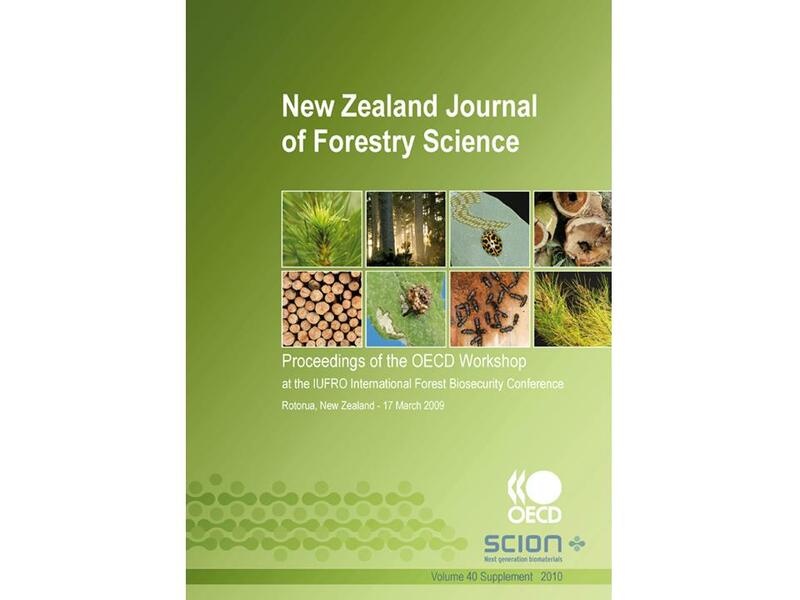 S3-S4) introduce the the proceedings of a workshop at the IUFRO International Forest Biosecurity Conference held in Rotorua, New Zealand on 17 March 2009 sponsored by the Organisation for Economic Co-operation and Development. Published Online - 21 Dec 2009. [543.5 KB] (pdf).